Two students were honored for their research. 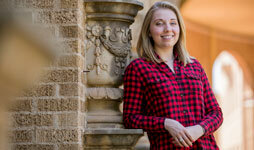 A Texas Tech University student was one of 240 in the United States selected for a Goldwater Scholarship, an award designed to encourage research careers in science, engineering and math. Amanda Miller, a junior from Plano, was selected from thousands of applicants to become a Goldwater Scholar in 2017, a year after becoming one of 256 students to receive an Honorable Mention for the same award. She is a biochemistry major minoring in psychology and biology, an undergraduate teaching assistant and an advocate for women in science, technology, engineering and math (STEM) fields. As a member of the Honors College, she serves as a First-Year Experience lead mentor and president of Eta Omicron Nu, the Honors College service organization. "I have always been passionate about science," Miller said. "I was a curious child who enjoyed learning about pathogenic microbes and astronomical discoveries. I fondly remember spending hours watching television programs with my father about black holes and magnetars. As I grew older, I began to believe that a career in medicine would best allow me to use my scientific understanding to help people. But as a result of my research experience as an undergraduate, I now greatly desire to become a research scientist and faculty member at a university. I would like to pursue a research career in nanomedicine/nanotherapeutics." Miller considers herself a chemist more than a biochemist; she works in an inorganic chemistry synthesis laboratory and wants to concentrate her research in the area of nanomaterials with significant medical applications. "I am particularly interested in chemistry's ability to inform our understanding of biological mechanisms and provide the opportunity to intervene in previously incurable conditions or develop novel diagnostic and therapeutic methods," she said. "I became interested in nanomaterials more specifically because I believe in the potential future that advancement in nanotechnology promises. I am fascinated by the seemingly magical Goldilocks Zone of the nanoscale, and I think that if we can master building machines and medical devices on the molecular level, we will have discovered something that can drastically change the medical industry for the better." Another Texas Tech student, Michael Doerfert, was one of the 307 applicants who received an Honorable Mention. Doerfert is a junior chemical engineering major from Wolfforth who plans to pursue a doctorate in biomedical engineering. His research has focused on using polymer science principles to study and design pervaporation membranes. Pervaporation – a separation process that makes use of a very thin, selective membrane to strip ethanol out of ethanol-water mixtures – could greatly increase the viability of ethanol as a biofuel by lowering the cost of production, but current membranes do not operate at the desired standards. Doerfert's lab is working to develop and produce ultra-thin membranes, rapidly screen membrane compositions and identify the materials with the best performance. "I really enjoy being able to apply what I know or have learned toward improving the world, even if progress is made only one step at a time," he said. "During my time as a chemical engineering major, I have made an effort to apply my education toward developing materials with potential to advance the state of the biofuels industry and provide cheaper, sustainable energy." Following graduation, Doerfert plans to seek biomedical engineering knowledge and skills in order to focus on solving problems in health care and improving quality of life. The Barry Goldwater Scholarship and Excellence in Education Foundation was created to support students who are working toward careers in STEM fields, and the Goldwater Scholarship is the premier undergraduate award of its type in these fields. It pays for tuition, fees, books and room and board for winners. 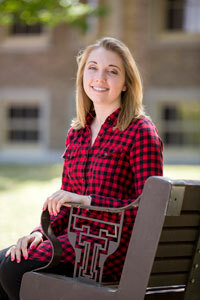 "Congratulations to Amanda for being selected as a Goldwater Scholar and to Michael for receiving Honorable Mention," said Texas Tech president Lawrence Schovanec. "This is a great personal distinction for these students, but their success also elevates the reputation of our university and is evidence that our undergraduates are increasingly competitive for major national awards. I want to thank the faculty and staff for providing the supportive and learning environment that helps to develop outstanding students like Amanda and Michael." Texas Tech has produced 35 Goldwater Scholars since the inception of the award in 1989 and currently has two Goldwater students enrolled. Hattie Schunk is a senior who received the award last year. NISF is dedicated to the enhancement of the academic quality and reputation of Texas Tech University by serving as a catalyst for the increase of national and international scholarships awarded to Texas Tech students. We provide support for high-achieving students by providing information and resources on national and international awards and offering services and programs designed to help produce more competitive scholarship applications. The Barry Goldwater Scholarship and Excellence in Education Program was created to support students who are working toward careers in science, technology, engineering and math (STEM) fields. The trustees award the scholarships up to 260 students from the United States, and it pays for tuition, fees, books and room and board for winners. The Honors College at Texas Tech is dedicated to providing students with a broad education that prepares them for a lifetime of learning. The Edward E. Whitacre Jr. College of Engineering has educated engineers to meet the technological needs of Texas, the nation and the world since 1925. Approximately 4,300 undergraduate and 725 graduate students pursue bachelors, masters and doctoral degrees offered through eight academic departments: civil and environmental, chemical, computer science, electrical and computer, engineering technology, industrial, mechanical and petroleum.